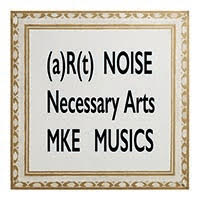 Thomas Gaudynski is a Milwaukee writer, sound and visual artist, and life-long entrepreneurial scholar. Originally trained as a visual artist, Gaudynski switched his artistic focus to sound art and text sound in his early twenties. His sound art is represented on over 30 recordings from Penumbra Music, Utech Records, (a)R(t) NOISE, and Necessary Arts. This collection consists mainly of CDs and liner notes. Liner notes include labels, dates, record labels, description, and artist instrumentation. CDs included are those of varying musical arrangements and a diverse assortment instruments and musicians. Also in The (a)R(t) Noise / Necessary Arts Collection box is the “Sound Recording Gift Agreement”, liner notes for the CDs, some photocopied news clippings, information concerning the music included in this box, and two vinyl records labeled “Object Lessons”.